According to the U.S. State Department, the world's most prolific terrorist groups are supported by the government of Iran, Sudan, Syria and Cuba. 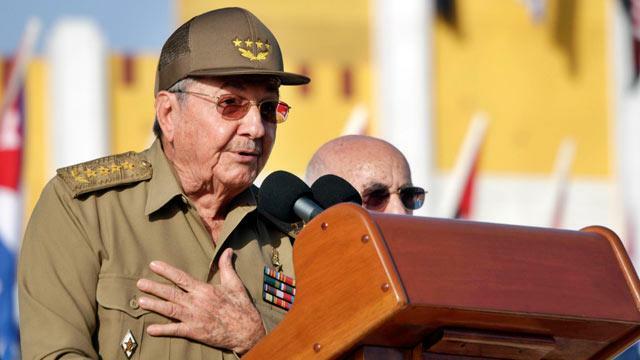 But while Iran, Sudan and Syria have well-known and documented current ties to various terrorists groups, Cuba's place on the list has increasingly come under fire. These four countries are considered "state sponsors of terrorism" that, according to the United States, have "repeatedly provided support for acts of international terrorism." They are subject to the harshest sanctions the U.S. can impose, including travel bans, financial transactions and trade. Last week the Boston Globe reported that Secretary of State John Kerry is planning to remove Cuba from the list, and that Obama administration officials no longer believe the Caribbean country meets the requirements to be labeled a state sponsor of terror. State Department spokesperson Victoria Nuland told reporters that the Globe's report was untrue. "This department has no current plans to remove Cuba from the state sponsor of terrorism list," said Nuland. "We review this every year, and at the current moment we -- when the last review was done in 2012 --didn't see cause to remove them." That doesn't mean there aren't advocates within the U.S. government who think America's policy towards Cuba needs to change. Senator Patrick Leahy, D-Vt., who led a delegation of U.S. lawmakers visiting the country earlier, told reporters that there needs to be more "give and take" between the U.S. and Cuba. "I think the worst thing that can happen is if we stay either in our country or in their country in this 1960s, 1970s Cold War mentality," Leahy said on CNN's State of the Union "We're a different century now. We should be looking at what's the future for their future and ours, what's the future for their children and our children." Leahy and the delegation were in Cuba to help free Alan Gross, a U.S. development contractor who's been imprisoned on the island since 2009. Gross was in Cuba working for the State Department's development agency USAID, installing communications equipment, when Cuban authorities arrested and convicted him of being a spy. Leahy met with both Gross and President Raul Castro, telling the Cuban president that relations between the countries would improve if Gross were set free. But the Cubans argue that Gross's imprisonment should not have any bearing on whether the country is considered a sponsor of terrorism. According to U.S. law, "in order for any country to be designated as a state sponsor of terrorism, the Secretary of State must determine that the government of that country has repeatedly provided support for acts of international terrorism." Cuba was placed on the list in 1982 for harboring members of the Spanish terror group ETA and members of Columbia's FARC. In last year's annual Country Reports on Terrorism, the State Department said that Cuba continues "to permit fugitives wanted in the United States to reside in Cuba and also provided support such as housing, food ration books, and medical care for these individuals." However the report also acknowledges that Cuba's ties to these groups today are tenuous at best. The State Department report notes that the Cuban government has actively tried to distance itself from ETA members living on the island, refusing to providing services to some of them. Leahy noted that over the decade Cuba has worked with the Colombian government to help broker a peace deal with the group, something the United States supports. The report also says that "there was no indication that the Cuban government provided weapons or paramilitary training for either ETA or the FARC" in 2011. A look at the report's explanation for the other three countries listed shows that they contrast sharply with Cuba. Iran, Sudan and Syria all are considered "active" sponsors of terrorist acts, according to the report, which cites as evidence funding and harboring members of Hezbollah, Al Qaeda-backed groups, and other extremist groups currently engaged in terrorist activity. There's also controversy over who's not on the list. North Korea, which was added in 1988, was removed by President George W. Bush in 2008 as part of deal to persuade the country to give up its nuclear program. In the years since, however, North Korea has flagrantly violated the agreement, and a subsequent UN resolution passed against the country for launching three missile and one rocket tests as well as conducting underground nuclear tests, the latest just this month. Iraq, Lebanon, Afghanistan, Pakistan and Yemen are all considered by the State Department as terrorist "safe havens." That means they are countries where, according to the report, "terrorists are able to organize, plan, raise funds, communicate, recruit, train, transit, and operate in relative security because of inadequate governance capacity, political will, or both." Yet none of those countries has risen to the level of being formally labeled a state sponsor of terror. The Cuban government says their continued isolation by the U.S. is not based on terrorism at all, but on politics. "If you look back in history, and look at the reasons why Cuba was put on the list, those reasons don't exist anymore, but Cuba continues to be included. Why does Cuba continue to be included?" asked Juan Jacomino, the spokesperson for Cuban intersection in Washington D.C. "There is a double standard, a lack of moral foundation in the U.S. policy towards Cuba," Jacomino told ABC News. He says keeping Cuba on the state sponsor of terror list is the State Department's way of justifying an "outdated" U.S. policy toward Cuba. "Keeping Cuba on the list is a justification for the U.S. policy to continue."